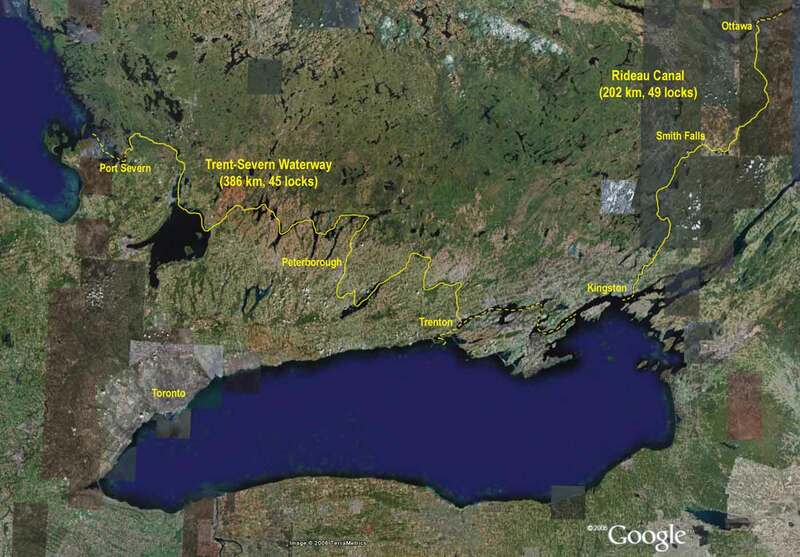 Two enjoyable, multi-day canoe trip opportunities in Ontario are the Rideau Canal and the Trent-Severn Waterway, as shown in the map below (click on the map for a more legible version). This page shares information for people thinking about paddling these waterways. The Rideau Canal was added in 2007 to the UNESCO World Heritage List. Both waterways are managed by Parks Canada. 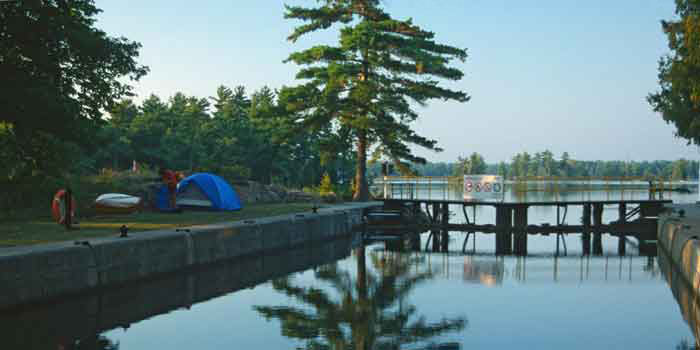 Camping is permitted at all lockstations (except Ottawa) and often is very pleasant: scenic, quiet, comfortable (on well-tended grass), with a 'swimming pool' (the lock basin, after hours). 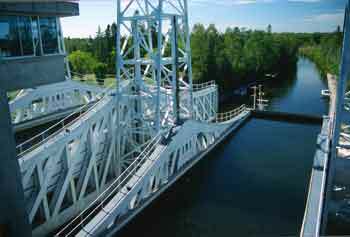 Most lockstations have drinking water and flush toilets (although sometimes the facilities are locked when the lockstation is closed); many have power outlets and telephone. Parks Canada's Rideau Canal brochure (also available on paper at lockstations) includes a table at the top-right with details of services at each lockstation on the Rideau system. There are also provincial parks and local conservation areas along both routes. 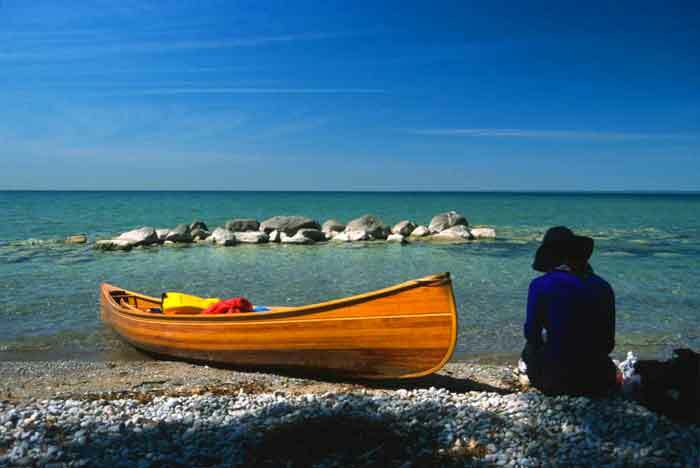 Camping fees for canoeists are assessed per person ($4.90 / person, in 2009). However, many lockmasters are relaxed about canoes and sometimes waive the fee. Most locks are in isolated areas and thus are quiet, but some are near urban areas or roads. Most locks are easily portaged, with convenient landings. Boats have to wait until a lockstation opens, but canoes can travel any time. Portaging a lock is much quicker than going through it. Both waterways are well-marked by red/green navigation bouys. Generally these indicate the most efficient route, but often a canoe can find much shorter passages. Lockmasters can advise on upcoming sections. A GPS with map capability is useful; often it is not easy to see where the canal is at the far end of a lake. Especially if your GPS has no map capability, it would be handy to have waypoints prepared for the entrance/egress of each lake, as it's not easy to obtain the information from a folded chart while in the canoe. Binoculars were handy for route-finding, also for watching the many heron and other wildlife. A GPS makes it easy to determine one's speed (our speed was about 6 km/h). We paddled full days, typically covering about 30 to 50 kms without much strain. 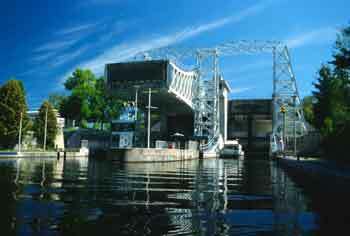 This GPX file rideauCanalGates.gpx contains approximate waypoints for the upper and lower gates of each lockstation of the Rideau Canal. After downloading it to your computer (right-click, Save Link/Target As...), you should be able to open it in programs such as Google Earth (File->Open) or upload it to your GPS via your GPS software (if you need it in another format, google for the open source conversion tool gpsbabel). The datum is WGS84 (which is within 2 m of NAD83). Good quality and beautiful paper charts of the canals are produced by the Canadian Hydrographic Service, but they aren't cheap or perhaps even necessary. On our 2009 Rideau Canal trip, with a hand-held GPS with a map capability and the simplified navigation map in Parks Canada's Rideau Canal brochure (available at most lockstations), we found it unnecessary to open the nautical maps we also had with us. Wind and waves are potential problems, especially on the big lakes. The route crosses what is usually the leeward side of Lake Simcoe. The presence of power boats is definitely a shortcoming of these routes; maybe 5 or 10 percent of routes could be rated as 'not enjoyable in a canoe' due to power boats. 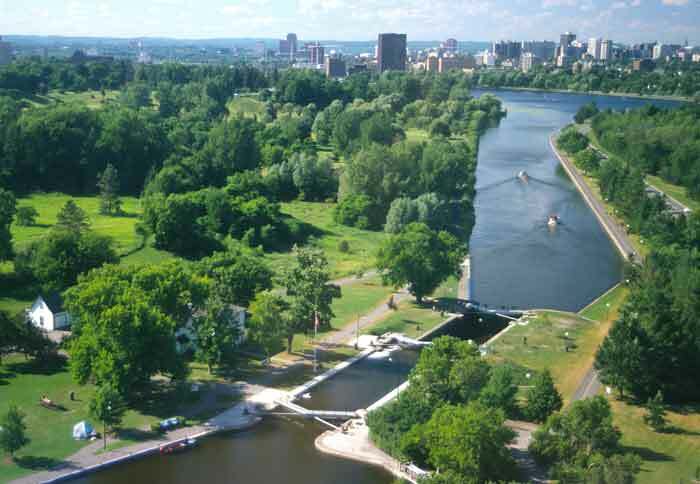 The Ottawa end of the Rideau Canal is noisy from nearby roads, lawn mowers, and airports. But for us, the other parts more than made up for it. July to mid-August is said to be the period of peak boat traffic. Our trips were in late August and early September, which turned out well. The weather at that time of year can be warm, sunny, and calm, though it can also be a time for 'monsoon' conditions (build up of cumulus clouds that can produce short showers in the late afternoon). Aside from inconsequential showers, we had excellent to perfect canoeing and swimming weather for all of our trips (notice how calm the water is in these photos). Crowding was not a problem; we were often the only overnighters and didn't see any other canoeists. Especially in mid-Sept, we were usually gliding along on calm water through countryside with no other boats in sight. Somewhere along the Trent-Severn, probably when swimming at the beach of McRae Point Provincial Park (an area frequented by geese), I picked up 'swimmer's itch' on my torso, a harmless parasite. It is perhaps a late summer thing. Towel drying, instead of luxuriating in the sun on the beach after swimming, is apparently a way to avoid this. Lockstations operate on shorter hours starting in early September, which can reduce access to washrooms (and fee collection). Groceries and food is available at a few points on both routes, including full grocery stores (eg., Smith Falls). We carried staples but topped up with perishables and treats as opportunities arose. As mentioned, water is available from most lockstations. The Tay River spur to Perth on the Rideau Canal was worthwhile. There is bus service between Ottawa and Kingston, and between Trenton and Port Severn (via Toronto). There is train service between Ottawa and Kingston. In 1997 (Aug 20 to 27) we paddled the Rideau Canal by driving the canoe to Kingston, leaving the car in a long-term parking facility on the harbour, and then paddling to Ottawa (where we live). We took the train back to Kingston to pick up the car (which took longer than expected because the train hit three cows). In 2009 (Aug 31 to Sept 6) we paddled the Rideau Canal from Ottawa to Kingston. The southern half is most attractive; having shorter-distance days in the beginning and longer-distance days at the end better suits the route's attractions and the development of one's canoeing muscles. These long-distance canoe routes offer many rewards with relatively low logistical effort. I recommend them.